Augusta, ME- April 2, 2009 – The state of Maine and the Carpet America Recovery Effort (CARE), a national carpet recycling group, have entered an agreement designed to increase the recycling of post-consumer carpet by diverting used carpet away from landfills and promoting the use of products that contain post- consumer carpet content. 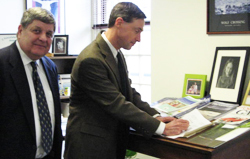 The agreement was signed by Maine Department of Environmental Protection Commissioner David Littell and representatives of CARE. CARE is a voluntary, not-for-profit group formed by the carpet industry, government agencies, and others who have agreed to find ways to divert and reuse post- consumer carpet. Currently, approximately five billion pounds of used carpet finds its way into the nation’s landfills each year. Since 2002, CARE and its network of Reclamation Partners have helped divert over one billion pounds of carpet from landfills. For its part, Maine will promote carpet recycling by seeking out reclamation opportunities for post- consumer carpet removed from government buildings and by using carpet pad under new carpet installations that is made from recycled carpet fiber . Made from cleaned and reprocessed carpet fiber, pad made from recycled carpet fiber is a safe and environmentally-preferable choice. “Used carpet is a bulky waste that is difficult and expensive to manage. Maine looks forward to adding the recycling of carpet to our efforts in developing alternatives to disposal in landfills,” said Maine Department of Environmental Protection Commissioner David P. Littell. “CARE welcomes Maine into the growing fold of states willing to support CARE’s voluntary efforts to find market- based solutions for the diversion of post- consumer carpet from landfills,” said CARE Board of Directors Chairman Frank Hurd.